There's been a lot of debate recently about the quality of startups that go through multiple accelerators. This all kicked-off with Sam Altman's post Getting Into YCombinator which discouraged the practice. Responses included Dave McClure's Plays Well with Others and Calcanis's Incubator Hopping. Unfortunately other than the above statement (with undisclosed data) a lot of this debate was driven by personal opinions rather than any firm evidence. I've done a fair amount of work analyzing startup data both for fun and profit so I naturally wanted to get a better answer. I started by pulling together a couple of data sets on seed accelerators, one a personal one I've being building for a while and secondly Jed's excellent Seed-DB and started crunching them. After filtering out the edge cases such as startups going through multiple cohorts of the same accelerator and startups that have gone through three or more accelerators I was left with a data set of 132 startups who have been through two accelerators (16 of which went through YC after another accelerator). Out of those 132 there are two clear successes (>$100m valuation) - Sphero (which has raised around $100m in investment) and GrabCad (acquired for ~$100m). PagerDuty (around ~$40m raised) likely falls into this group as well. Roughly around 1-2% of all accelerator alumni end up at >$100m so from this initial analysis it doesn't appear going through multiple accelerators is a strong negative signal. However the problem with this approach is that it doesn't adjust for cohort age (older companies naturally tend to be larger) or more importantly the quality of the accelerator. We'd expect the alumni of top-tier accelerators to be significantly better than those from an average accelerator in any case. Another issue with this approach is that we're talking about a tiny handful of companies so the numbers can be very easily skewed. I got around these problems by creating a dataset that reasonably represents a group similar to our "double accelerator group". For each startup in our group I randomly picked another startup that was in the same cohort/accelerator to control for that effect and added it to the comparison group. I then generated several hundred comparison groups so I could measure the variance we would expect to get from random luck. I then segmented the groups by bands of how much money they had raised (using that as a proxy for progress) and measured the percentage of startups that fell into each band. The green diamonds show how the double accelerator group performed compared to the boxplot showing startups going through their first accelerator. Not only is it not a negative signal, but overall companies that go through multiple accelerators tend to do meaningfully better than average for raising money <$20m and the same as average for raising above that (as these cohorts mature I wouldn't be surprised to see the >$20m raises also increase to above average). While startups going through a second accelerator might do better in general the same might not apply to YC; after all YC is somewhat unique among accelerators. So I reran my analysis using only the 16 YC companies  comparing them against their own cohorts. While there are some differences we again see that overall startups for whom YC is their second accelerator tend to be more likely to raise at each band then the average YC company. In practice almost all of the returns for an accelerator come from a handful of unicorns and we can't know at this stage if any of these companies will become unicorns, but based on the early date there's no evidence that they won't come out of this group. This should come with the proviso that YC almost certainly has better data than I do on their portfolio (I'm likely missing a number of YC companies which have been through other accelerators) but I'd encourage YC and any other accelerator looking at this to make sure they're analyzing their data in a reasonable way. I'm more than happy to share my modelling code with any accelerators which would find it useful. The 16 companies for reference were Bagaveev Corporation, Final, CribSpot, Labdoor, Chariot, Seva Coffee, Nomiku, Valor Water Analytics, Leada, Plate Joy, uBiome, FlightCar, Vayable, chute, MarketBrief and PagerDuty. I’ve had a few startups ask me recently regarding the pros-and-cons of going the open source route especially regarding the types of business models that are viable for open source based companies. Given how influential open source has been over the last two decades, surprisingly little has been written in the public domain on the topic so I’ve put together a broad summary. I’ve illustrated the models with examples, these include companies where the company hasn’t been the primary developer of the underlying open source product but still has the product at the core of their business. Also known as the “Red Hat Model” it’s based around the provision of a services business for users of the open source product. Typically this includes support contracts, training and certification, consulting and customisation work. Example vendors include RedHat and Hortonworks. One of the original open source business models it now faces some concerns over the low margins and issues of competitiveness. While the company that creates an open source project has some competitive advantages when selling services (direct access to core engineers and product mangers, brand, lead-gen, etc.) there’s still significant risk in competitors underpricing due to not having to pay for the products development costs (i.e when Oracle significantly undercut RedHat for Linux support work). Most open source companies will offer some level of services although increasingly startups are now waiting until they reach a level of maturity before building out a significant services (read “consultancy”) business. Earlier stage startups are tending to offer services limited to specific areas which have additional value-add to the product business (training of third party vendors, support and bug-fixes). The hosted or “managed’ model is where the vendor provides a hosted version of the open source product. These businesses tend to largely fall into traditional SaaS (Wordpress, Odoo) or IAAP (Joyent, Heroku) models. In many cases this is combined with the "Value-Added SaaS" model where proprietary offerings are combined with the hosting service in order to provide a competitive defence against lower cost competitors offering equivalent hosting services. With open-core the core part of the product is open-source but with the vendor offering an enhanced version as proprietary commercial software. Typically this is done by having a “core” version of the product which is open source and then an “enterprise” version of the software which includes features such as analytics, security, auditing, etc. which are likely to be required by high-end customers. Vendors using this model include Cloudera, SugarCRM and Mongodb. In some cases vendors will offer these features as add-on products rather than as a drop-in replacement to the main product (for example ElasticSearch). This business model is similar to that of traditional proprietary software vendors. However there exists a risk of conflict-of-interest when a vendor is deciding whether a feature should go into the core or enterprise edition of the software which can fuel resentment among users of the core product. There’s also the risk that other third parties will develop open source alternatives to the enhancements. One of the newest models is the Value-Added SaaS model which is similar to the open-core model but where the proprietary software is provided as a SaaS service. This model is particularly effective where the SaaS service has a network effect as it can create a strong defence against new vendors entering the market. Vendors taking this route include GitHub and Docker (the later has yet to release their SaaS offering). The Marketplace Model is where the vendor creates a platform for commercial products or services that relate to the open source product. The platform then charges a commission on transactions. The most successful use of this model has been Google Android with their Play store, but other vendors have included Themeforest (Themes for Open Source CMS systems) and historically OpenX (ad-exchange integration into their open source ad server). Again due to the strong network effects implicit in marketplaces we’re likely to see more open source startups with this model in the future. Dual-licencing is the model where the vendor relicences the open source project under a traditional commercial propriety licence for a fee. Vendors have included MySQL and Trolltech. At one time this was considered to the be the future of open source businesses (Gartner once stated “By 2012, at least 70% of the revenue from commercial OSS will come from vendor-centric projects with dual-license business models.”) — however this model is now largely considered dead. Historically there were two major factors driving this model (1) The dominance of usage-restrictive and viral open source licences which restricted commercial integration (2) Companies being uncomfortable with using open source software. However most modern open source projects now favour Apache or MIT style licences which are much less commercially restrictive and open source software has now become mainstream and widely accepted into businesses. Some modern open source companies such as MongoDB still offer dual-licensing but it’s generally regarded as a service to enable customers who would otherwise be unable to use the product rather than a core revenue stream. "Uber for X" has become commonplace model for startups but often such startups overly-focus on ease-of-delivery rather than what made Uber truly disruptive. Uber built a marketplace in a highly fragmented market that allowed them to change the entire dynamics of an industry. The taxi industry is only one of many industries that are ripe for disruption from online marketplaces. Much of the money currently spent on mainstream advertising (Google, Facebook, traditional media, etc) is by vendors who would be better served by industry specific marketplaces; and it's only a matter of time before those marketplaces appear. That naturally raises the question of what makes a market suitable for an online marketplace. To answer that question I’ve been working on a framework to help evaluate markets based on their intrinsic properties. Do customers make multiple transactions within a reasonable time-frame (i.e. several+ transactions a year) ? If customers are regular buyers it means a marketplace can amortise the cost of customer acquisitions over multiple transactions. Lack of this behaviour means high customers churn (thus lower lifetime value) and a constant need to acquire new ones just to maintain size. Repeat buying also allows for stronger brand building and building a relationship between the marketplace and consumer. If a marketplace can’t extract more value from a customers acquisition than an individual vendor can then it reduces the incentive for vendors to be on the marketplace. In some cases bundling together of related markets can create multiple-buying behaviour when the individual underlying markets may not have it. For example while the markets for plumbers, electricians, locksmiths, etc. might not exhibit regular purchases the aggregate market for hiring tradesmen might do so. Do customers regularly switch between vendors ? High-vendor loyalty can have much the same impact as a lack of repeat buying as both parties have a strong incentive to take future transactions off-platform . Some markets have intrinsically low vendor loyalty as consumer needs vary between transactions (for example for with AirBnB people switch vendors because they travel to different locations or Just-Eat because people don’t want the same takeaway all the time). High vendor loyalty can be countered with strong on-going value-add beyond the initial connection (Escrow, insurance, ease-of-purchase are common “value-add” techniques) or owning the relationship with the customer (i.e. essentially anonymising the vendor actually providing the service like HomeJoy do). Is there customer spending of $10bn+ in the market ? Most VCs are looking for startups with the potential to reach $1bn+ valuation which implies a market an order of magnitude bigger than that. Is there "untapped demand” that can be unleashed by a marketplace ? Some markets have “untapped demand” - demand that exists but doesn’t convert into transactions because of complexity in purchase process. Common examples include markets where consumers are worried about quality/risk (e.g. peer-to-peer vacation rentals) or where finding the right vendor is hard (e.g. handmade items). Are there key problems in the consumer experience that can be solved ? Trust is a key-example; in many markets where marketplaces have succeeded there have been significant trust issues around factors such as personal safety (Uber, AirBnB, etc.) and remote transactions (Ebay, oDesk, etc.) where marketplaces have put in place trust structures (vetting, reviews, monitoring, etc.) that improve customer experience. Lack of transparency/feedback is another common problem that marketplaces solve. GrubHub provides live-tracking of food deliveries; fiverrr shows average response time of service providers and Linkedin benchmarks job applicants against other applicants. Improving consumer experience can allow marketplaces to charge a premium to consumers who would otherwise be incentivised to transact off-platform (Instacart for convenience; StubHub for guaranteeing ticket legitimacy). Is there a fragmented supply-side with small vendors controlling a large part of market ? A fragmented market typically means higher customer acquisition costs for vendors. Marketplaces deliver benefits of scale and marketing and give vendors more power to compete based on their service/product rather than on customer acquisition strategy. Decision making for consumers is often complex due to variety of choices and difficulty in comparing vendors. Marketplaces add a lot of inherent value by making finding and comparing vendors easier. Larger vendors have lesser need for marketplaces, have disproportionate negotiating/pricing power and prefer direct relationship with consumers. In many such industries (i.e. insurance, budget airlines) vendors go out of their way to even stop price aggregators so it can be tough environment to operate in. Is the market low-conversion for individual vendor but high-conversion for the overall transaction ? Some markets (e.g. housing) are defined by high-levels of shopping around between vendors before a transaction takes place; marketplaces have a significant advantage in such markets because their overall conversion rate is going to be higher than that of any individual vendor giving an advantage for customer acquisition. Are there unique “add-on” services that a marketplace could deliver to their supply side because of their position ? OpenTable offers restaurant management software, Ebay Motors offers consumer financing and Amazon Marketplace offers warehousing. In all cases they’re services that the marketplaces are in a unique position to offer and cause significant stickiness (discouraging vendors from moving elsewhere) as well as bringing in additional revenue streams. Would a marketplace reduce the barrier-to-entry into the market ? If a marketplace allows new vendors to enter the market or for vendors to service part of the market that was inaccessible to them before this can cause a fundamental economic shift in the market allowing for more varied offerings and more competitive pricing. Such vendors can give marketplaces significant boost because they’re often exclusive to their platform and thus have closely aligned interests. Can the entire transaction be captured on-platform ? First-generation marketplaces (craigslist, autotrader, yelp, etc) were essentially lead generation tools with the transaction happening off-line; modern marketplaces have tended to focus on markets where the transaction can be captured online. If a marketplace doesn't have access to the whole transaction it forces them to rely on intermediate stages. 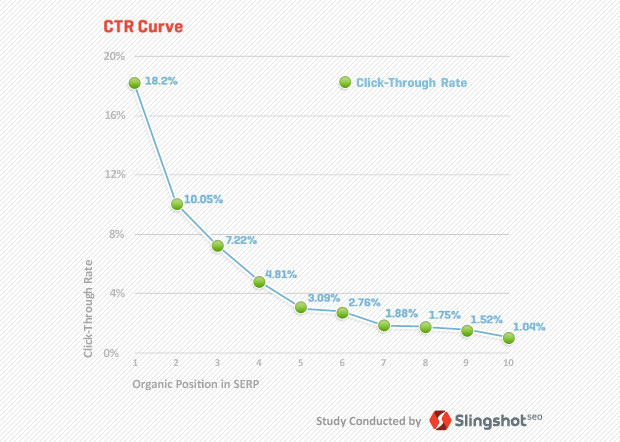 Typically this results in optimising for lead generation rather than for completed transaction. This can result in misaligned incentives, such as job boards focusing on maximising number of job applications rather than quality of applicants. Without knowing the value of the transaction marketplaces are forced to price generically. They have to choose between over-charging for low-value transactions pushing them off the platform or underpricing for high-value transactions where they can’t capture the value being delivering to the vendor. In practice successful off-platform marketplaces use flat-fee or subscription models that tend to underprice the value delivered to high-value transactions but operate in high-value markets (housing, autos, recruitment, etc.) so even pricing for the low-end of the market results in decent profits. 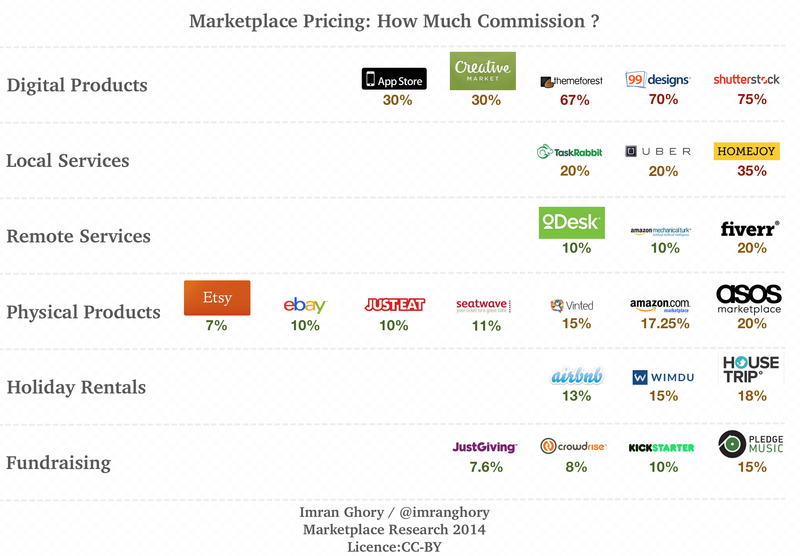 Are the market participants willing to move to an online marketplace ? Some markets are reluctant to move online. Typical characteristics of such markets are being relationship driven, high-levels of secrecy, price negotiation and high-customisation. A common case is markets where publicly advertising availability causes negative signalling Employment market for high-profile individuals (actors, sports people, company executives) and the M&A market are examples. Another common case is when there’s significant pre-sales work to customise the transaction. Many consultancy and professional service businesses falls into this category. Very few marketplaces have succeeded in bringing these types of markets online so far. Angellist is a notable exception but it’s not clear if it’s success is generalisable. Solutions may have to be very domain specific. Are the market participants willing to pay for a marketplace ? Either the vendor needs to be willing to give up a cut of their revenue or the consumer needs to be willing to pay a premium. Taking commission from vendors is more common; generally in sophisticated markets where the pay-per-customer model is the norm (through online advertising, referral fees, etc.) it’s fairly straight-forward to on-board vendors on this basis. In markets where this isn’t the norm and especially low-margin industries this can be much more difficult. Consumers paying a premium is more unusual; having to pay more via a marketplace than they would if they went direct incentivizes the consumer to avoid using the marketplace. Hence the marketplace has to deliver significant added value if this is the approach taken. Markets don't have to have all of these properties for a marketplace to be successful, but markets without a significant number of these properties have tended to struggle. This framework is very much still a work in progress so feedback would be very welcome. The three make for an interesting comparison study with Just-Eat and GrubHub being very similar businesses and Zoopla being a very different one, giving some insight into what a modern "unicorn" marketplace looks like and what early-stage marketplace startups should be aiming for in the long term. (All currency amounts have been converted to USD; market cap as of 14th August; the ratio is marketcap/revenue rather than PE ratio). While all three marketplaces have broadly similar revenues it's notable how much the valuations of GrubHub and Just-Eat have diverged post-IPO with GrubHub trading at significantly higher ratio (they have similar expenditure and growth figures). It's hard to say if the pricing is "bubbly" but it shows a clear geographic influence in pricing. Although it's not obvious how much of the GrubHub premium is because of it's dominance in the US market (the largest single take-out market in the world) and how much of it is down to the fact it's listed on a US exchange. Either way the implication is that US marketplaces can enter the unicorn club with lower revenue figures than non-US marketplaces. On a broader level if we take 12-13x as a lower bound for these ratios then that implies a marketplace needs to reach annual revenues of around $80m to get into the unicorn club. Although it's worth noting that these ratios are for high-growth marketplaces which are the dominant players in their markets. 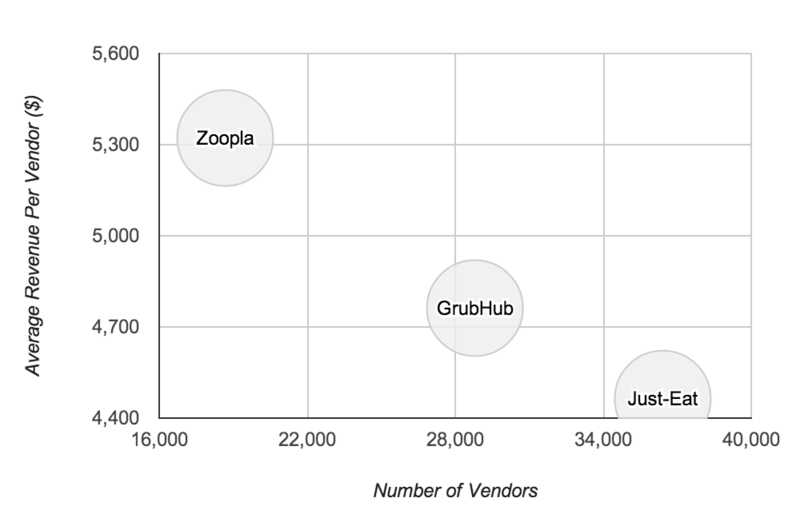 An insight worth pulling out is that even though the Just-Eat/GrubHub charge using a commission model (typically charging around 10% per transaction) and Zoopla charge on subscription model (vendors pay a monthly fee) that the revenue/vendor/lead figures work out roughly the same. It's not a case of unicorn marketplaces having to use one model or the other. Given that the definition of a lead is very different for the takeaway marketplaces (an order being placed) and for real-estate (an expression of interest in seeing a property) the revenue-per-lead being similar might be coincidental; however there might also be some market dynamics at play that explain the similarity (i.e unicorn marketplaces that charge an order of magnitude less would require vastly more transactions making them much rarer). The number of vendors and revenue/vendor that early stage marketplaces should be targeting becomes much more obvious if we graph the companies. As all the companies have similar revenues they fall roughly along what we can call the "unicorn line" - if a marketplace is serving a market in which it's hard to cross-above the line (i.e too few vendors; not enough value generated for vendors) then it's likely to be hard space to build a unicorn marketplace. This weekend was #FutureBookHack, a hackathon which brought together hackers that were digital leaders from top-tier publishers (Faber, Harper Collins, Pan Macmillan, Penguin Random House, and Simon and Schuster), as well as other industry experts including industry analysts (Nielsen), booksellers (Blackwells) and literary agents. While The Bookseller has extensive coverage of the event itself, there hasn't been much coverage of the key themes that emerged not only from the formal presentations/workshops, but also from the more informal discussions that took place over the weekend. Given such a unique collection of experts, there was a lot of industry insight which I've gathered together to share with a wider audience. I've split it into - the more formal topics; (discoverability, audio books and children's books); the informal ones (Netflix for eBooks, Publishers vs Self-Publishing); and then rounded up some of the more insightful smaller points. Given how "hot" this topic has been over the last year, it was almost an inevitable that this was bought up a number of times. Almost always via a participant raising it to one of the publishers rather than vice versa. The overwhelming view from the publishers, was that the model didn't work for the dynamics of the book market. The fundamental argument being, that most readers aren't restricted to the number of books they read because of cost, but because of time. While a music listener or movie watcher might significantly increase their consumption as the incremental price drops to zero, book readers are already close to their limit in how many books they can read. For example, with music a single is only 2-3 minutes long, so with a subscription service the amount of genres to which a consumer listens increases significantly. An average book takes 10-20 hours of reading time and many consumers already purchase more books than they are able to read. The fact that piracy hasn't occurred for eBooks in the way it has for movies and music, adds weight to the viewpoint that eBook consumption isn't price restricted. As this is the case, it seems impossible for a pricing model to exist that would both make sense for publishers and readers. Readers can't be given more value for the same amount of money, and publishers can't justify the cannibalization of their sales market if subscriptions can't produce similar revenues. Publishers also lack secondary revenue streams (merchandising, concerts, etc.) that allow other industries to justify the low revenues from services like Spotify. However, there might be exceptions for particular genres where reading patterns are different, and this has been demonstrated in a few markets. Comic books (via Comixology and Marvel Unlimited), and technical books (Safari) are both examples where readers are likely to increase consumption. They're also both markets where consumers often purchase physical editions of books they already have in electronic form, further reducing the impact of cannibalization. There may also be other factors that play into market dynamics for specific genres beyond volume of readership. For example with academic books, a subscription model on the reader's side would be of value to students who would no longer have to carry around heavy books, and on the publisher's side it would solve the major problem of secondary market resales. Some publishers are however looking at alternative ways of segmenting subscription markets. For example, book serialisation and models where consumers can subscribe to a particular author. When self-publishing of eBooks first took off, there was significant concern in the industry that the self-publishing market could end up disrupting the publishing industry. This left many publishers in an existential crisis, questioning what they actually did, and how they added value. As the eBook industry has matured the initial concerns have largely been allayed, with publishers finding that in general, self-published authors would prefer a traditional publisher if given the option. Publishers now often sign up successful self-published authors, and source new books from services such as WattPad. Taking on such authors reduces the upfront risk of investing in a book, as the authors have already proven demand, so the overall impact has actually been positive for publishers. Arising from these discussions was also the wider topic of what precisely publishers consider their “key value-add” and why authors still wanted to go with traditional publishers. Reputation, risk and expertise were the three key factors. Risk: as the the publishers take on the upfront risk in paying for advances and investing in editorial, marketing, and printing costs. Expertise: not only covers both the services such as - editorial, proofing, and marketing, but also the publishers expertise, and position, in managing the overall process. While publishers outsource many of the services that they provide to freelancers, they add value by managing those relationships. This both prevents exploitation (as authors aren’t expert buyers of these services), and removes direct commercial incentives from the equation (if the author was paying the editor directly it would impact the author-editor relationship). The ability for consumers to discover new books was something that concerned all the publishers, who were keen to see technology formalizing traditional methods of discovery (social recommendation systems, aggregation of professional reviews ala Metacritic), as well as more innovative approaches. The general feeling, was that current discovery approaches had significant weaknesses. Such as best sellers lists (both online and off) generally being rigged for editorial and commercial reasons, and recommendation engines (typically of the form of “people who bought x often bought y”) being skewed against new and more unusual books. There was also interest in how improvements in book metadata could result in better discovery (i.e applying SEO techniques to optimize books appearing in the right searches), with most metadata currently being optimized through human expertise, rather than via data-driven approaches. In part, it felt the concern over discoverability arose from the power that Amazon had over owning the key search, rankings, and book recommendation systems (both via Amazon.com and also via subsidaries such as GoodReads and Audible), and an interest in reducing the dependency on a single vendor. Channels to market was the key topic among the publishers addressing audio books. While consumer demand is growing, there was visible frustration in the difficulty publishers faced in getting their product to customers - both in terms of discovery and delivery (large file sizes, clunky software). Audio books form a unique set of challenges due to the way the market is fragmented at the moment. A literature student listening to an author reading his/her own work, gets a significantly different take on the work, as against a listener who opts for audio books while driving, or from a parent who uses a children's audio book as a substitute for a bedtime story. At the moment, the majority of the digital audio book market is core genre adult fiction. This is partially due to the dominance of Audible, who's subscription model and marketing focus is on that group. Audio book production is expensive to do properly as it requires studio time, a producer, and a voice actor. Due to this cost, base audio books are generally priced on the basis of length, although there is significant variation in how each is priced by the retailer. So while audio rights to books are typically inexpensive, the high fixed production costs, the nascency of the market, and the fact that audio books sales don't seem to cannibalize the sale of non-audio versions, makes publishers keen to broaden the appeal of this medium. The overwhelming interest from publishers, was to see new services that made it easy for consumers to access audio books, and many were actively looking into technologies such as streaming, and more consumer-friendly business models. An unexpectedly hot area was children’s books, one of the few areas of publishing which is seeing a significant growth in print. It is also an area in which publishers are keen to see digital developments that will allow them to reuse their image assets for incremental revenue. Due to the picture-heavy and interactive nature (pop-ups, pull-tabs, etc.) of these books, publishers are finding existing eBook formats and tools ineffective in bringing these books to digital platforms like the iPad. Several publishers had experimented with building apps tailored around specific books offering enriched content, but found it wasn't successful as it was difficult to build into workflow, and also expensive with costs not being recouped from sales. In general, enriched content (author interviews, extra background, etc.) was hard to sell. There was not much consumer interest in paying for it. Industry experimenting with an eBook first model, where a traditional publisher publishes the eBook first and looks how it performs before deciding if they want to go to a print edition. The creation of a long-tail market by growth of eBooks and print-on-demand is often overlooked. It used to be 100k unique books that were actively selling, now it’s 1m+. Long-tail generates revenue, but not in economically viable amounts for anyone, but is useful for residual revenue from books that have done well in the past and require no further investment. Most publishers make the core of their money from “mid-tail” books with blockbusters being “bonuses”. The ebooks market is shifting to multifunction devices (phones, tablets), and away from eReaders. eReader users often read on other devices as well. On mobile devices eBooks have to compete against not only other eBooks, but also other forms of entertainment (music, games, etc.) available on mobile devices - often for a very low cost. Some print book genres have been decimated not by eBooks, but apps taking their place. For example, maps (replaced by Google Maps) and travel guides (replaced by Tripadvisor). Subscription - Startups that charge a regular flat fee (typically monthly) for their services, most typically SaaS services. Marketplace - Startups dealing with multi-sided markets where a commision is taken when participants on different sides of the market transact with each other. Advertising - Startups which generate money through selling advertising space or through lead-gen.
Pay-as-you-go - Startups using metred charging models where users are charged based upon usage. Retail - Startups making one-off sales in the traditional retail transaction model. 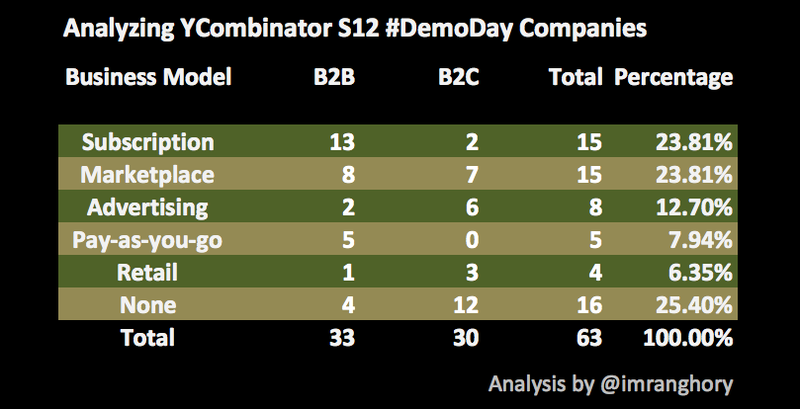 The split between startups targeting businesses and consumers seems to be pretty even, in an article last month I covered how AngelPad strongly prefers b2b startups; this doesn't seem to be the case with YC. Only a quarter of the startups that presented had no business model to date, although that rises to forty percent if you look purely at the consumer startups which suggests YC is still open to funding consumer startups that have the potential to be massmarket without a clear revenue stream. Perhaps most striking was how popular the marketplace model is; historically YC have funded relatively few marketplace startups (presumably on the basis that the differentiator between marketplaces is down to traction and marketing rather than technology). However the huge success of AirBnB and other marketplace startups (Etsy, KickStarter, etc.) in recent years has possibly made them rethink their stance. Last night I attended a poker game sponsored by AngelPad (and kindly hosted by Pusher) who were looking to promote AngelPad as an accelerator to UK based startups. Thomas (founder of AngelPad) kicked off the evening by giving an introductory talk via Skype and holding a short Q&A session. As there was a lot of useful information in that session I decided to do a write-up to help anyone thinking of applying who wasn't able to attend. Their deadline for their next season is this sunday and you can apply here. I've add my own comments in [square brackets] to distinguish what Thomas said and my own take on what was said. 90% of the application comes down to the video, some people who review the application may only see the video and nothing else. It's worth doing multiple takes to get it right. They want teams that are already commited to the startup and are already working on it full time (i.e aren't still in day jobs). Under a year old, they worry that startups that are older than that tend to lose momentum and drive. They've had 15 non-american teams go through AngelPad so far, 13 of them are still in the US. They've found British startups do better than other international startups, possibly due to not having to deal with a language barrier. One complaint I hear from startup founders raising seed rounds is that it's often hard to know which VCs are open to doing early stage seed round investments and what size of investments they make. Hence I've been doing some research and the following is a list of all significant VC funds who've made angel investments in London over the last year and a list of the companies they've invested in - in many cases the VCs in question have done a mix of seed and later rounds; the companies I've listed are specifically ones they've invested in at a seed level. Where a fund has explicity stated the size of investments they make I've used those numbers, in other cases the numbers are estimates based upon the reported size of investments they've made in their previous portfolio companies. Two VC funds in particular stand-out from the crowd in terms of the number and nature of the investments made: Passion Capital (who primarily focus on early stage investment) and Index - both of whom are definitely worth considering for any startups seeking to raise significant seed rounds. I've not included the following VC funds because I've been unable to identify any seed round investments they've made since the start of 2011: Balderton Capital, Dawn Capital and Eden Ventures, The Accelerator Group. Apologies to anyone I've missed out or any mistakes in the above; feel free to contact me with corrections/additions at imranghory@gmail.com or @imranghory on twitter. Last weekend Seedcamp ran their inaugural seedhack, a weekend hackathon style event bring together industry specialists and developers to form new startups. Seedhack was pitched as a much more "serious" event compared to similar events such as Startup Weekend and Launch48, with the aim of having real startups emerge from it. 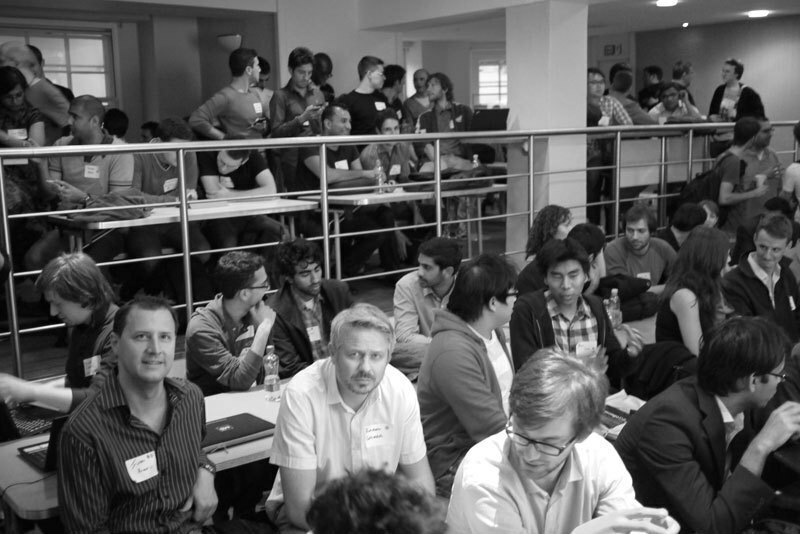 Startup Weekend and Launch48 are much more pushed towards having fun, learning and networking. That some real startups such as Zaarly have emerged out of them has been more in the way of a bonus for these events. Seedhack bought in industry speakers, encouraged small team sizes and tackling of "real" problems, had paperwork to deal with ownership issues, and filtered the people attending (asking potential attendees if they were in a position to create a new startup, etc.). They also had two themes Healthcare and Big Data to help focus ideas on real problems for the weekend. Unfortunately it doesn't seem to have worked, the products built were mostly similar to those found at any other event (apps for dating and coordinating meetups with your friends) and the follow-on rate (the number actually becoming startups) is likely to be similar. The themes (healthcare and big data) were announced after most people had already signed up. It was clear many of the attendees had little or no interest in these themes. There was also a clear lack of inspiration when it came down to ideas for healthcare startups because there were so few people (either on the developer side or the business side) who had worked in healthcare. It would have made much more sense to have the themes decided upfront and the event promoted it on that basis (as for example the Education themed Startup Weekends are doing). It would have produced much more "aligned" interest among the crowd and likely result in far more innovative ideas. The theme speakers while very interesting, were probably at a bit too high level for the event. As someone asked the healthcare speakers in the Q&A "but what are the problems you want us to solve?". There were also several vague references to healthcare APIs but it would have worked much better if speakers had gone into details of the APIs. Also it would have been better if the theme speakers went before the more general technical speakers as it would have allowed the audience to be thinking about theme related ideas that could be tackled with the technologies being talked about. The logistics of creating teams didn't work very well. Seedhack took the approach of having a forum for people to post their ideas and online voting. While the concept was sound, in practice this really didn't work with only a handful of people even voting on the forum. The flakey wifi in the room and lack of 3g signal probably made it difficult even for those who wanted to vote to do so. Team formation was done in breaks without any real co-ordination and it wasn't really clear what was going on. Launch48 and Startup Weekend both use a similar format which works much better: Anyone who wants can standup in front of everyone and deliver their pitch, followed by a manual voting process, typically either a show of hand or by use of post-it notes. The top voted pitchers then move to separate parts of the room holding signs indicating what they pitched and attendees can go and find the teams they want to join. In fairness L48 and SW have both run dozens of events and know from experience that online voting tends not to work (not just because of technical difficulties but offline voting also makes attendees more invested in the ideas they voted for - an important psychological aid to team building), but seedhack should draw on the expertise of these other events. From speaking to a lot of the attendees business development and product management fundamentals was one area that many were lacking. While this was partially made up for by the mentors, it seemed many of the teams failed to ask fundamental questions such as "why is this better than the other solutions to the same problem?". While this doesn't really matter for weekend projects, if seedhack is seeking to inspire real startups out of it they should encourage participants to think about these issues. While I don't want to seem overly harsh about seedhack especially as this was their first time running it, I do think their concept of a more serious version of L48/SW makes a lot of sense and has potential, so hopefully they'll iterate in true startup style and the next event will be closer to its mark ! Yesterday we launched Startup News, a new component of our site with a user-ranked list of startup-related links. We created this partly for our own use: we've now funded about a hundred people, so it doesn't work well anymore to send links around by email. Another reason we created news.ycombinator is that there is currently nothing like it. 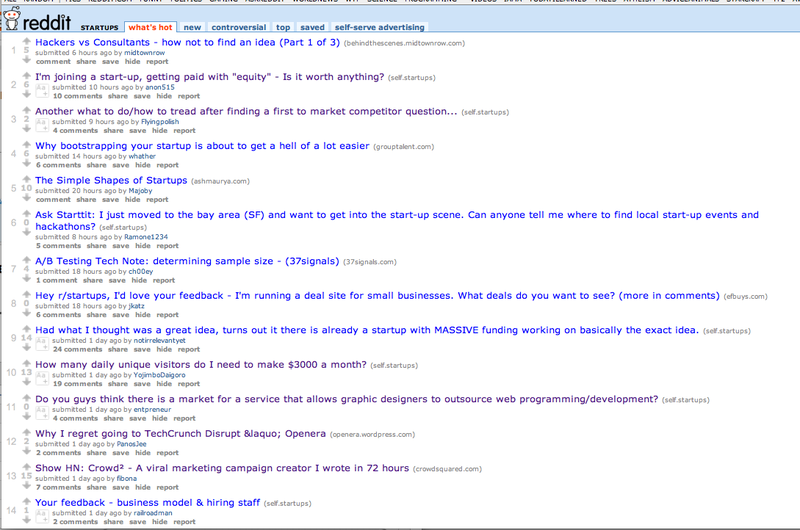 Reddit used to have a good concentration of startup-related links, but that was because so many of Reddit's initial users were connected in some way to Y Combinator. Now that Reddit is so much more popular, the top links tend to be images, or videos, or political news. But the most important goal of news.ycombinator was to create a place where founders and would-be founders can meet and talk. There are three stories related to startups on the front page, by comparison there are five stories about Google, three about Microsoft and three mainstream news stories. It's not that these links didn't apper on HN, a lot of them did, they were just drowned out quickly by other more mainstream stories. Hacker News used to have a good concentration of startup-related links, but that was because so many of Hacker News's initial users were connected in some way to startups. 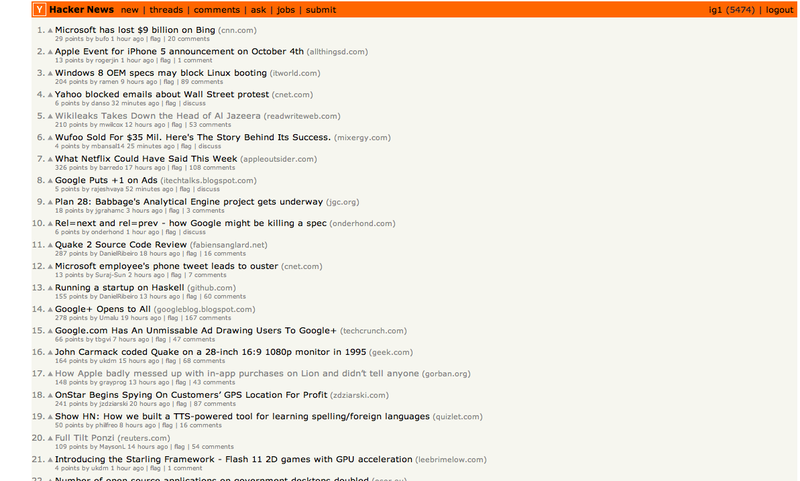 Now that Hacker News is so much more popular, the top links tend to be general technology, or geek, or political news. The easiest way for me to handle this is to be up front about all of these investments and disclose it in posts, which I’ve done and will continue to do. Techcrunch has run articles on startups without disclaiming Arrington's investment. Arrington has invested is stealth startups and can't disclose their identities. Full disclosure isn't done when TC makes an editioral decision not to cover a startup competing with one of Arrington's investments. Full disclosure itself would result in giving an advantage to startups Arrington invests in. In practice inserting disclaimers into coverage isn't happening. For example this post announcing Zaarly's launch which happened two months after Arrington invested in them (according to his Crunchbase profile), not only did it not disclose Arrington's investment, but it also listed the other seed investors while missing out Arrington's name. Furthermore of all the articles covering Zaarly's competitors such as TaskRabbit not a single one contains a disclaimer covering Arrington's investment in a competitor. While I don't think this was done on purpose, I think it clearly shows that even in clear-cut cases it's hard to get disclosure right. But in complex cases it's probably close to impossible. And unfortunately since Arrington became an a limited partner in SV Angels he's now likely to be an investor in all future Y-Combinator companies. Techcrunch have recently been covering a large number of YC companies as they launch before demo day and not a single one of these posts has had a disclaimer about the conflict of interest. TC has regularly given favourable coverage to YC launches for a number of years, so again I don't think TC is giving YC favourable coverage as a result of that investment, but there's a huge difference between giving an incubator positive coverage purely because you like them and when you have an investment (indirectly in this case) in them. There are likely to be cases where Arrington isn't legally able to disclose an investment. Many YC companies operate in stealth mode, meaning that investors can't disclose their existence. The obligation to keep the investment secret directly contradicts the principle of full disclosure. The nature of Techcrunch also creates difficulty. TC doesn't on the whole run op-ed articles (with a few notable exceptions) on startups, but rather focuses it's editorial judgement on choosing which startups to cover and give publicity to. Hence to follow the principles of full disclosure they would need to not only disclose investments in articles, but also make disclosures in cases where they decide not to write articles. Again this is something that doesn't happen in practice. Imagine the scenario: Techcrunch runs a negative story about a competitor to one of Arrington's companies, because of full disclosure Arrington inserts a disclaimer about his investment. The disclaimer would essentially be a free advert for the company he invested in running against an article slating it's competitor. The principle of full disclosure would mean that his companies would get favourable coverage by getting mentioned whenever their competitors got coverage. These four problems mean that it would be very difficult for Arrington to stay on in his position as Editor of Techcrunch without violating journalistic ethics of full disclosure and the stated editorial policy of both Techcrunch and their parent company AOL. Michael Arrington has resigned since I wrote this article. Even though I'd spent a long time following the startup scene and reading all the standard blogs and books before founding my first startup CoderStack (a job board for software developers) when it came to actually putting theory into practice I ran across a lot of gaps in my knowledge. So I've decided to write a series of blog posts describing my experiences and sharing the advice that I wish someone had given me before I started. I've tried to roughly break the blog posts into themes and the first (this one) is going to be about user acquisition. If I look back at my own plans from before I started working on my startup I actually cringe a little at my user acquisition strategy, I made the same mistakes that I see many other startup founders making now. My strategy was made up of broad terms like "SEO" and "Advertising" without any serious attempt to model how much traffic each of these approaches would generate and what the cost of user acquisition would be. Any form of user acquisition has a cost, it might be defined in terms of your time rather than money, but unless you sit down and create a model for analyzing the amount of traffic you can generate and what that will involve you have no idea if a particular form of user acquisition is worthwhile. Any form of user acquisition can also be modelled whether it's viral growth, PR, SEO, etc. By sitting down and building a model in Excel it helps you evaluate the strategy and understand the hidden assumptions (for example for viral growth what percentage of your users will tell their friends about your product) you're basing your business on. If I'd done that to start with it would have saved me a huge amount of time down the line. Once you launch and are actually implementing your strategy it's trivial to update your spreadsheet and replace your assumptions with the hard data and see how that impacts the end results. You might find that once the assumptions have to be modified to match reality that the strategy you're using no-longer works. And it's much much better to find that out up front rather than six months down the line when you're wondering why you haven't grown as fast as you expected. SEO is hard, one prong of our growth strategy was getting decent rankings for focused keywords like "Python jobs". I went into this without really understanding SEO as well as I should. Even through I managed to get first page listing for many keywords (we were helped by getting links from sites like Techcrunch and Business Insider) getting into the top position for competitive keywords is much harder than I thought. As a new startup you automatically get a penalty for not having an "aged" domain (older websites get higher ranking), but it's close to impossible to beat off sites which have hundreds of thousands of established links, even if those links aren't as focused. I also didn't really analyse the numbers as I should have, the phrase "Python jobs" gets roughly 500 searches a month in the UK. The top ranked result for that search will probably only get 20% click-through (i.e a hundred visits). If you're 5th in the rankings, you'll probably get 15 visitors a month. In many cases the SEO effort taken to improve rankings wasn't worth the resultant traffic. If you plan to use SEO as strategy for your startup make sure you use Google Keyword tools to figure out how many searches are made on the keywords you're targeting and how many links, etc. you'll need to get in order to get a worthwhile ranking (I've found Seomoz and SEMRush can be good for this). On pretty much any ad platform you can reduce your costs by optimizing your ads (in some cases by as much as 100x), so it's definitely worth investing time and money to learn which optimization techniques work well on the ad platforms you're using. Our original business plan was based around buying long-tail technical keywords (e.g. "concurrenthashmap") on Google cheaply, this strategy didn't work as it was based on the underlying assumption that long tail keywords with no other advertisers would be cheap. It turns out that due to the changes Google have made to the Quality Scoring algorithm part of their Adwords platform it's very hard to buy cheap adverts on non-"commercial intent" keywords. We were however lucky that we managed to figure out an alternative strategy (extermely targeted ads on social networks) that turned out to give us the cost effective advertising we were after. Having a social media strategy is often equated with having a presence on social media websites, but there are actually lots of different types of presence. The first two help you keep in touch with existing users and perhaps generate repeat business, but don't really help you gain new users. If you want to use social media as a user acquisition vector you really need to make sure you fall into the last category, and that means focusing on generating content that your users want to promote to their friends. If you're a content based startup it's definitely worth driving your content through your Facebook and Twitter content streams, because it's content far more than anything else that gets shared through the social networks. Direct sales is one of the highest converting ways to get users. How effectively this scales obviously depends on how much each user is worth to you as it typically has a high cost per user acquired. Even if it's not a viable long term strategy for your business it can be good way to get your initial users. I'm not a natural extrovert and I still cringe a little when making sales cold calls or sending sales emails, but it's much easier than you think and once you get started it gets easier. The first few cold sales are the hardest. It also has the huge advantage that you're speaking on a one-to-one basis with many customers and getting invaluable feedback that can help you iterate on your product. That's it from me on user acquisition, if you have any questions or have particular areas you'd like me to talk about in detail feel free to leave a comment. You can also follow me at @imranghory on twitter. Since the launch of Y Combinator six years ago there have been countless competitors spring up all around the world, the primary competitive differentiator being that of location. YC's stellar reputation both in terms of expertise and connections to VC firms has been unrivalled and due to it's international nature, accepting teams from all around the world, it has been difficult for other seed accelerators to compete in attracting the best early stage companies. However the last year has seen a new type of competitor to YC spring up: Specialist seed accelerators which differentiate themselves from YC not on the basis of location but rather on the basis of focusing on early-stage companies that serve a particular sector. By focusing on particular sectors, especially those with unique challenges or difficulties in getting to market, these accelerators are providing a real challenge for traditional seed accelerators like Y Combinator and Techstars. If you want to start a startup building things for schools, we encourage you to apply to Imagine K12, because frankly, we couldn't help you the way they can. So who are these specialist seed accelerators ? The financial sector probably produces more custom built software than anyone else in the world and it also produces a lot of startup founders (Wikipedia, Amazon, Delicious and PayPal were all [co-]founded by ex-finance people). The regulatory frameworks and the nature of selling to large financial firms makes it especially likely that a specialist seed accelerator would be able to add a lot of value. All marketplaces (or more generally any two-sided market business) tend to face similar problems when it comes to bootstrapping and getting around the chicken-and-egg problem. A seed accelerator with expertise in all the different approaches in tackling this problem could help a lot of marketplace startups get over the initial bootstrapping hurdle. What other sectors do people think could benefit from specialist seed accelerators ? Whenever people talk about Facebook Ads (or even more generally "Can Facebook justify their $50bn valuation?") the conversation always tends to swing around to how poorly Facebook Ads perform. This wasn't always the case. When I started out running Facebook adverts I saw low click-through rates (CTRs) and expensive costs per click (CPCs). Initially I was left with the same impression as everyone else: this doesn't work. But part of me didn't quite believe that, so I set out to read everything I could on Facebook Ad optimizations, and when I discovered that wasn't much, I started putting time (and money) into running experiments. After about two months worth of experiments my ad performance had increased dramatically (literally a hundred-fold). I'd discovered that with a little work Facebook Ads can be hugely profitable. I gave a talk on this topic at the London ProductCamp in February and more than a few of the audience were surprised at how much difference tweaking ad copy and targeting can make. I think what convinced people at the talk more than anything was the hard-data, when I said "I'm paying 1p/click" that's when the audience really started paying attention. Unfortunately there's very very little hard data out there to convince people about how effective Facebook Ads can be, while I was willing to share my real-world performance data at an unconference I'm hesitant to publish it in public where my competitors could use it to compete against me. Given the inherent commercial nature of advertising everyone else seems to have the same opinion on secrecy so very little real hard data gets published, and most of the data that gets published tends to be from ad campaigns that haven't done well (as the information doesn't give competitors any advantage). To rectify that (and also to test my optimization skills) I decided to run an ad campaign from scratch for one of my side projects (my webcomic Theory of Geek) and publish the data. In the interest of openness I should declare at this point that I got approval from Facebook prior to publishing this data, but that they didn't see this data beforehand, they just knew I was writing an article about Facebook Ads and wanted to publish ad campaign data. The important column to look at is CPC as that's how much we're paying per ad click, the worst performing advert was at £0.58 and the best performing was at £0.003. That's a difference of 200x. For those of you who aren't familiar with buying ads, a CPC of below £0.03 is practically unheard of on any other ad platforms, and what we're getting on Facebook is 10 times cheaper than that. Of course you could argue that as I'm advertising a webcomic I'm going to get a much higher CTR (and thus lower CPC) than if I was advertising something more "serious". For my software developer job board to target software developers I am paying more than in this ad campaign, my best ad for CoderStack was 3x more expensive than my best ad for Theory of Geek. But despite that I'm still paying an order of magnitude less on Facebook than I'm paying on any other ad networks. I'd also like to comment on how this entire ad campaign and all the optimizations were done with a budget of under £20. Even if you're running a bootstrapped startup, you'd have to be crazy not to at least experiment with buying Facebook Ads given the low cost of experimenting and the high potential upside. I plan to write some more articles on Facebook Ads, covering the practical side of doing ad optimizations and also what I think Facebook should be doing in order to make their ad platform better for advertisers, if you'd be interested in reading them then follow me on twitter @imranghory where I'll post links to my articles as I write them. My ad campaign targeted only the US and UK markets, CPC was slightly lower for the US than for the UK due to a higher CTR. This is my fourth blog in the last three years, but it's the first I'm publishing directly under my own name. My last three blogs all achieved reasonable success each managing to build readerships in the tens of thousands, but in part that's why I've decided to start this one. When I meet people at conference or meetups it's getting to the point where many people recognize one of my blogs, but not me, which feels ... odd. So I figured it's time to start blogging under my own name to remove the cognitive disonnance.